What’s most important function of a blower door? Is it to provide a measurement of how much a building leaks? Is it to establish credibility with a potential customer? Is it to estimate energy savings from air sealing? All those answers are wrong. A blower door can do all those things, but they are not the most important thing. The main function of a blower door is to discover individual leaks worth sealing, and to verify that they have been sealed. Is that what you do with yours? Or do you collect a number before the project and collect another afterwards, and pretty much leave it at that? When the air sealing is going on, is the blower door even on site? Is there anyone on the crew who knows how to use it? How do you tell if something that looks like a leak actually leaks? Many of them don’t. How can you tell when something leaks even though it doesn’t look like it should? Sometimes it does. How can you tell if your attempt at air sealing has worked? Sometimes it doesn’t. If you are not using a blower door, you can’t do any of these things. I can’t, either. Nobody can. Picture yourself as a soldier in the war against leaks. You have your gun (caulk, foam) at the ready. Ahead of you is the enemy. But they’re not in uniform. They are hiding within the civilian populace. Your job is to find and kill them. But if you can’t identify the enemy, how can you take them out? Do you just shoot everyone? That might work, but the cost would be high. Do you just guess, based on appearance? You’ll probably get some, but you won’t get them all. And you’ll shoot some civilians by mistake. And what about the ones you shoot? Admit it, you don’t even know if they were leaks in the first place. And you don’t know if they are dead now, or just pretending to be. That would be a really foolish way to fight a war. It would be much better to have a way to determine where the real problem is, and to verify that it has been solved. If you do the wrong thing over and over but don’t know that it’s wrong, you just keep doing it, right? That’s what happens when you seal something that may or may not leak, or when you don’t know if your attempt succeeded. In either case, you don’t know if you accomplished anything or not. You’re no smarter than you were yesterday. We’ve talked before about attics and attached garages. It’s very important to isolate them from the living space. 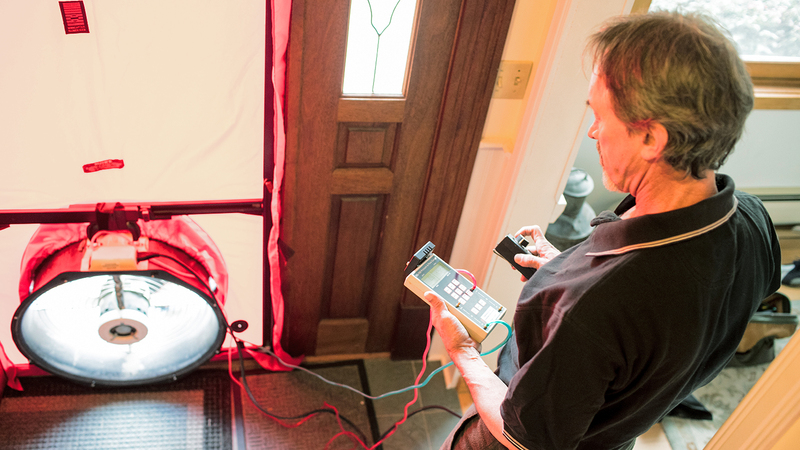 With a blower door, you can measure the connection. You can know for sure whether or not you have accomplished the goal. Without a blower door, you are just guessing. Who does the final test? Are you making a separate trip to the site to do that? That’s not very efficient. What happens when the final test shows that stuff has been missed? Do you fix it, or do you let it go because it’s not worth making yet another separate trip? Wouldn’t it be good to know about that before the crew leaves? Occasionally there are combustion safety issues at the end of the job. Would it be better to know about the safety hazard before the crew leaves the site, or to find out about it several days or weeks later when the auditor returns? How do you protect the family in the interim? Historically in our business, there has been an assumption that the auditor is the position requiring the most skill. I don’t agree with that. The crew leader is the person who needs to be the most skilled. In order for things to work well, the crew leader needs to know everything the auditor needs to know, plus a bunch of organization and installation skills. Why not have your crew leader do the test-out? Now your auditor only needs the blower door half as much and it becomes easier to free it up for the crew. Crews are better motivated when they can measure their work. The atmosphere changes from following the checklist to becoming actively involved in getting results. They can teach themselves, because the blower door can show them what works and what doesn’t, what’s worth doing and what isn’t. Each job leaves them a little more skilled for the next one. Can someone do air sealing without a blower door? Of course. Can someone build a house without a tape measure? Of course. But would you hire a carpenter who doesn’t use one? And then there’s the end game. The air sealing isn’t done just because the crew has done everything obvious and everything on the auditor’s list. There are still leaks left, and some of them weren’t even leaking when the auditor was there. The house is different now. Some of the air flow paths have moved to different locations. And there are probably leaks in the living space that can cause comfort problems even if they aren’t very big. The end game means taking one more look -- while the crew, tools and materials are still on site -- to see if there are still leaks worth sealing. There usually are, and it will never be as easy and quick to fix them as it is right then and there. The end game is what distinguishes a comprehensive air sealing job from a partially-informed attempt. It can often be the difference between an apathetic customer and one that is truly impressed. At Efficiency Vermont, we’ve just changed the Home Performance requirements so that only one BPI certification (Building Analyst) is needed to conduct the testing. We’re planning to offer a BPI certification class this fall. This would be a great time to get your crew leader(s) certified. And we are still offering (if there is interest) a single-day training designed for crew members who want to know how use a blower door to air seal more effectively. Let’s put our blower doors to best use by giving them to the people who can create the most value by using them. Let’s give our crews the tool they need to get good results on each project, and to learn on each project how to do the next one even better.